Twenty-first century battlefield explorers have audio tours, computer apps, and GPS devices to help direct their wanderings. Would anyone be so old school as to carry a book to guide them? If they had Carol Reardon and Tom Vossler's comprehensive, easy-to-read, field guide to Gettysburg, they would. Reardon is a renowned Civil War scholar and author. Vossler is a combat veteran, a former director of the U.S. Army Military History Institute, and a licensed battlefield guide. 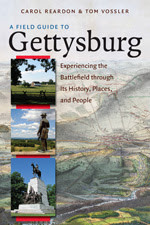 Both authors live in Gettysburg and their easy familiarity with the terrain, the historical facts of the battle, and eye-opening local anecdotes make the guide a valuable companion for first-time visitors, veteran battlefield trampers, as well as armchair explorers. Photographs and informative maps add a contemporary feel to the historic geography of the Civil War's most hallowed grounds. Built around six critical questions, each of the 35 stops throughout the park's 6,000 acres offers “a detailed account of a specific element of the three-day engagement.” From the National Park Service's new and improved visitor's center to The Soldier's National Cemetery, the visitor/reader is told what happened there, who fought there, who commanded there, who fell there, who lived there, and what was said later about what took place there. Answering the same questions at each location helps the reader grasp how the multitude of individual actions fit together and contributed to the outcome of the battle. Along the way, marginal events gain prominence, accepted facts gain clarity, and old historical “truths” are interpreted anew in light of modern historiography. More than two million people visit Gettysburg National Military Park every year. Accurately describing and interpreting events during this signature battle influences the nation's public memory of this seminal event. The authors state that their goal is to give both visitor and reader “a better appreciation for the complexities of mid-nineteenth century combat” and a better appreciation of the challenges facing historians “who seek to uncover an ideal called historical 'truth' in the midst of Gettysburg's myriad voices and assessments.” Reardon and Vossler succeed admirably on both counts.